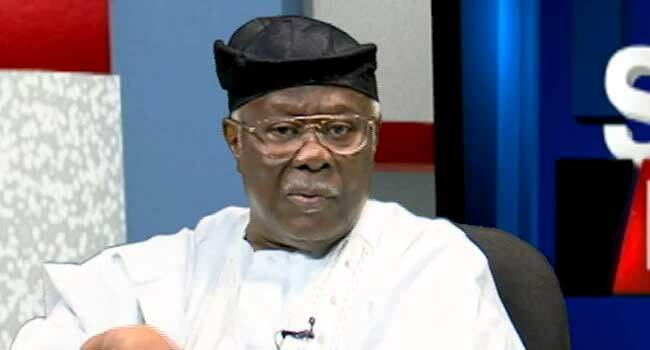 A member of the Board of Trustees (BoT) of the Peoples Democratic Party (PDP), Mr Bode George, believes political parties in the country lack ideological differences. He said this during his appearance on Channels Television’s political flagship programme, Sunday Politics in Lagos. “For me, if you look at the Nigerian politics, all political parties don’t have ideological differences – where you say far-right, far-left or centre-right, centre-left – we don’t have that,” the PDP chieftain said. He also described the recent defection of dozens of members of the National Assembly from the ruling All Progressives Congress (APC) to his party as ‘very good indeed’. The erstwhile PDP National Vice-Chairman in the South-West noted that most of the defecting lawmakers were members of the opposition party who decided to return home after trying their luck somewhere else. He was confident that the PDP has the capacity to contain the crisis that led to the exit of the lawmakers from the APC, having learned from their mistakes. “You can’t but have such crisis and what will be the measure of the managers?” George asked, stressing that it was the capacity to handle and resolve the crisis. The PDP chieftain explained that the party was established for the purpose of ensuring that there was ‘oneness and genuine cohesion’ among the various ethnic groups in the country. He noted that Nigerians were demanding configuration, attitude, and commitment to servicing the people from their leaders. George said the people were tired of fake promises but interested in what the government would do to satisfy their basic needs in the areas of education, job employment for youths, and infrastructural development among others. With about seven months away from the general elections, he was hopeful that the PDP would wrest power from the APC in 2019, saying they have the right candidates. “The question we need to ask our own electorate is are you better off today than before? If you are better off then vote APC and if you are not better off, you have that date with a history that you look and pray to God to direct you,” said the PDP BoT member. On Tuesday last week, Dino Melaye (Kogi), Rabiu Kwankwaso (Kano), Suleiman Hunkuyi (Kaduna), Abdulazeez Nyako (Adamawa), Barnabas Gemade (Benue), Ibrahim Dambaba (Sokoto), and eight other senators had announced their exit from the APC. Similarly, Danburam Nuhu, Mark Gbilah, Razak Atunwa, Ahmed Bichi, Abdulsamad Dasuk, Zakari Mohammed, Sani Rano, and 30 other members of the House of Representatives had also dumped the ruling party.